From the rafters of Rupp Arena, the largest basketball-only sports auditorium in the nation, hangs a well-worn jersey on which a name and a number important to Central Arkansans glisten in white on a sea of blue. “Burrow” is the name and “50” the number, and they honor a native of Malvern who brought glory to himself, Hot Spring County and the University of Kentucky. Six hundred miles southwest of the arena is the timber-rich region of “The Natural State,” where Robert Brantley Burrow was born on June 29, 1934. In the aftermath of the Second World War, Bob’s lumberjack father received an attractive offer to serve as foreman of woods with a major lumber company in Wells, “a sawmill town” but an important railroad hub in central East Texas. He accepted it, yet never were the Burrows to sever ties with Bob’s native soil. In 2018, his sons retain ownership of numerous acres surrounding Malvern. Wells developed him for both life and higher education. In his two years at the high school, he was a favorite both on and off the court, serving as editor of The Buccaneer, the school’s yearbook, graduating fourth in his class and earning election by his peers as “Mr. Wells High School” as well as “Best Athlete.” Townspeople were so taken by the 6-foot-7 student-athlete that they delighted in calling him “Slim” and joking about his need to duck when slipping through a doorway. 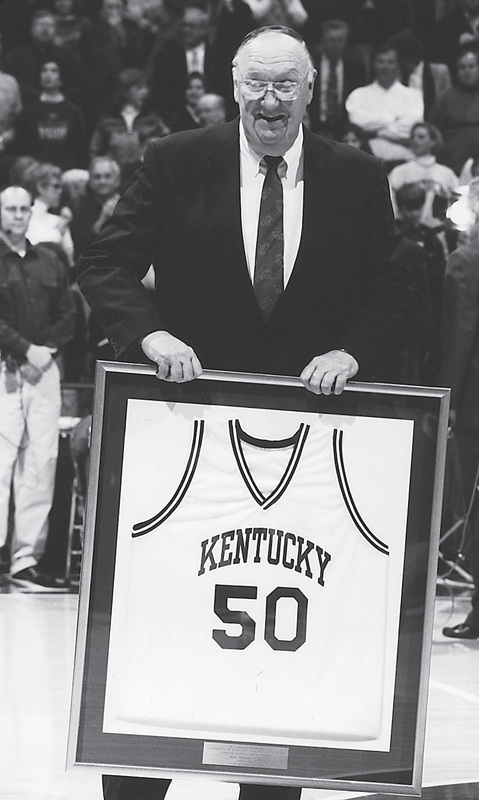 Bob Burrow when his number was retired at the University of Kentucky. Awaiting him upon graduation in 1952 were several basketball offers. But he imposed an unusual demand upon recruiters: he would accept a scholarship only if it were accompanied by a scholarship for a less gifted teammate, Billy Brown, the small guard on the Wells High basketball team whose passes had allowed “Slim” to score almost at will. Bob’s basketball excellence was so widely trumpeted throughout the nation that every major university coach hungered for his services. One who had never seen him play but believed the superlatives in which his assistant coach bathed the 1954 National Junior College Tournament’s “Most Valuable Player” was quick to offer him a scholarship. Adolph Rupp’s reputation had preceded him: Bob was so flattered that the iconic mentor wanted him for his fabled program that he unhesitatingly accepted. Neither Rupp nor Bob regretted the sight-unseen recruitment. The latter was a Wildcat star from Day One, and accomplished more in two seasons than many an outstanding performer accomplishes in four. Leading Kentucky to a 43-9 record, Bob poured 1,023 points through the nets and collared 823 rebounds before graduating in the spring of 1956. He averaged 20 points per games during the two seasons, leading the Wildcats in scoring in both, and his impressive 14.6 rebounding average of his senior year, he had exceeded during the previous campaign with the program’s best-ever 17.7 season average. In his junior year, he set a single-game program high against always formidable Temple University by grabbing a spectacular 34 rebounds. Truly, as a sportswriter proclaimed over half-a-century later, “He was the original Mr. Double-Double” as a scorer and a rebounder. Truly, too, he earned the All-American honors that fell to him after each of his Wildcat campaigns. Two seasons of solid professional play followed. In 81 National Basketball League games, Bob tallied 459 points while garnering 180 rebounds. His heart lay with public education, however, and in the fall of 1958, he launched a multi-decade career that included both teaching and coaching, and in 1997, he retired as superintendent of public schools in Fort Knox, Ky.
Today, Bob resides in Franklin, Tenn., grateful that his retired jersey hangs from the rafters of Rupp Arena, indebted, also, to Hot Spring County and the 501, both proud that his origins lie in their soil.